The Landing Co.Best of Houzz 2017 - The Landing Co. 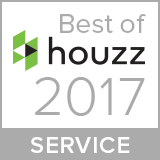 The Landing Company is honoured to receive a “Best of Houzz” award from Houzz the leading platform for home remodelling and design. The Best of Houzz is awarded annually in three categories: Design, Customer Service and Photography. Customer Service honours are based on several factors, including the number and quality of client reviews a professional received in 2016. We have our amazing clients to thank for this great honour. Thank you for your glowing reviews and for giving us the honour of bringing you in for landing. Please visit our Houzz profile to see our work, read our reviews and experience what it feels like to have landed.